Today we started picking peaches. Our crew was hard at it at 6:00 a.m. this morning picking early cling peaches at our Belle ville farm. I couldn't sleep waiting to see the first peaches of the season. The first picking was light, as it usually is. We harvested 30 totes and will be back in the orchard Tuesday to harvest many more. We harvest the same trees 5 times (every three days) to catch the fruit at the peak of maturity. It is much more expensive to operate this way but it is the only way to get peaches at the highest eating quality. 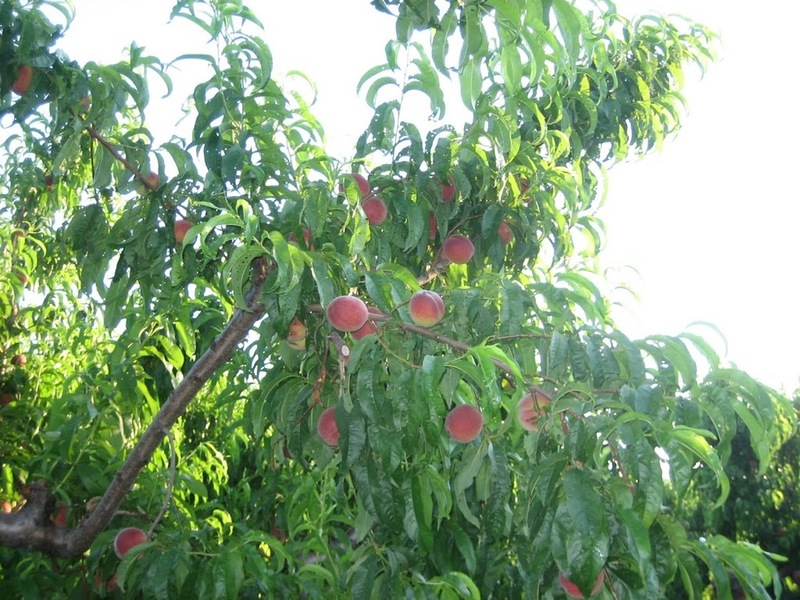 Once a peach is harvested, it no longer produces additional sugar, more time on the tree equals more sugar in the peach. The first few days of picking are always a learning experience for the crew. Here you can see Martin Mauricio working with his crew to teach them how to find fully ripe fruit. Martin has been working in our orchards for 19 years. It sounds easy but it takes a trained eye to distinguish ripe fruit from immature. An experienced picker can harvest up to 150 totes in a 8-10 hour shift in 100 degree orchards with no breeze and totally covered in peach fuzz. Once the fruit is harvested it is hauled into our packing house located behind the country store. There the fruit is washed, sized and packaged for sale at Eckert's Country Store. When we are harvesting at full speed, the fruit can go from tree to store in less than one hour. The only way to get it closer to the tree is to pick it yourself. I can't wait to get to the thick of peach season!